Leveled items are typically obtained as quest rewards. The item is scaled in power based on the player's level at the time the reward is given. Some leveled items become stronger in both their physical and magical characteristics, while others only improve their enchantments. The items do not improve in quality when your character levels up. 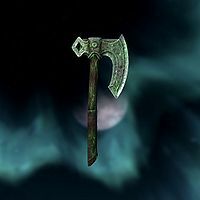 Some, such as the Axe of Whiterun, are random leveled items with a random enchantment in which the displayed name of that specific instance (that reference ID) is changed to be unique. In these cases the item does not have a unique base ID or set of base IDs. For full leveled statistics on each item, please visit the main article relating to these items, which is linked in the name of each item listed. This article only lists items that are leveled. For items that meet the definition of artifacts, see Artifacts. 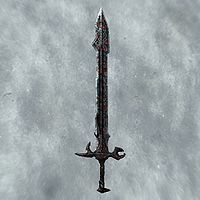 The Gauldur Blackblade is a special ancient Nord sword found at Folgunthur in the possession of Mikrul Gauldurson. The weapon's enchantment absorbs health from whoever is slashed by it over one second. Tempering the Gauldur Blackblade requires one steel ingot and the Arcane Blacksmith perk. As is customary for honed draugr weapons, the benefits of tempering are doubled if you have acquired the Dwarven Smithing perk. For more information, including leveled statistics, see the Gauldur Blackblade article. 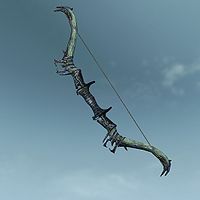 The Gauldur Blackbow is a special ancient Nord bow found at Geirmund's Hall in the possession of Sigdis Gauldurson. The weapon's enchantment drains magicka from whoever is hit by one of its arrows for one second. Tempering the Gauldur Blackbow requires one steel ingot and the Arcane Blacksmith perk. As is customary for honed draugr weapons, the benefits of tempering are doubled if you have acquired the Dwarven Smithing perk. 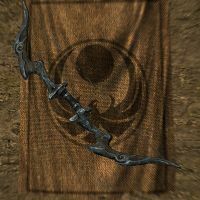 For more information, including leveled statistics, see the Gauldur Blackbow article. 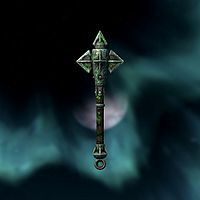 The Lunar Iron Mace is a special iron mace that can be occasionally found at Silent Moons Camp. Its enchantment causes light damage over one second on whoever is struck by the mace. Tempering the Lunar Iron Mace requires one iron ingot and the Arcane Blacksmith perk. For more information, including leveled statistics, see the Lunar Iron Mace article. 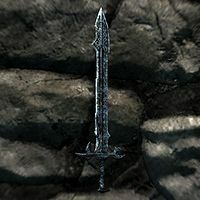 The Lunar Iron Sword is a special iron sword that can be occasionally found at Silent Moons Camp. Its enchantment causes light damage over one second on whoever is struck by the sword. Tempering the Lunar Iron Sword requires one iron ingot and the Arcane Blacksmith perk. 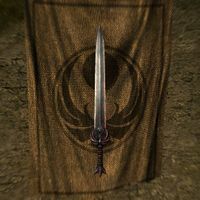 For more information, including leveled statistics, see the Lunar Iron Sword article. The Lunar Iron War Axe is a special iron war axe that can be occasionally found at Silent Moons Camp. Its enchantment causes light damage over one second on whoever is struck by the axe. Tempering the Lunar Iron War Axe requires one iron ingot and the Arcane Blacksmith perk. 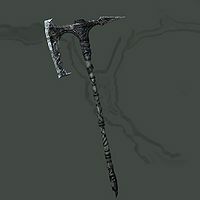 For more information, including leveled statistics, see the Lunar Iron War Axe article. 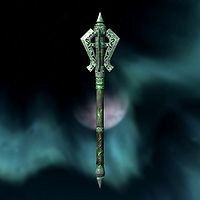 The Lunar Steel Mace is a special steel mace that can be occasionally found at Silent Moons Camp. Its enchantment causes light damage over one second on whoever is struck by the mace. Tempering the Lunar Steel Mace requires one steel ingot and the Arcane Blacksmith perk, with the tempering being twice as effective if you have gained the Steel Smithing perk. For more information, including leveled statistics, see the Lunar Steel Mace article. 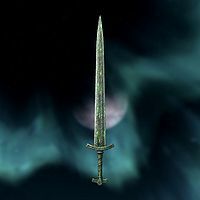 The Lunar Steel Sword is a special steel sword that can be occasionally found at Silent Moons Camp. Its enchantment causes light damage over one second on whoever is struck by the sword. Tempering the Lunar Steel Sword requires one steel ingot and the Arcane Blacksmith perk, with the tempering being twice as effective if you have gained the Steel Smithing perk. 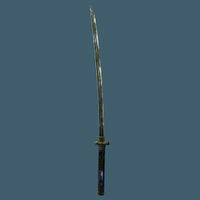 For more information, including leveled statistics, see the Lunar Steel Sword article. 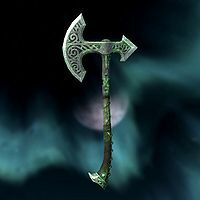 The Lunar Steel War Axe is a special steel war axe that can be occasionally found at Silent Moons Camp. Its enchantment causes light damage over one second on whoever is struck by the axe. Tempering the Lunar Steel War Axe requires one steel ingot and the Arcane Blacksmith perk, with the tempering being twice as effective if you have gained the Steel Smithing perk. For more information, including leveled statistics, see the Lunar Steel War Axe article. The Pale Blade is a sword rewarded to you for completing The Pale Lady. 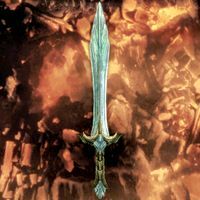 The sword's enchantment causes instantaneous frost damage, and also inflicts its target with fear for thirty seconds. Tempering the Pale Blade requires one steel ingot and the Arcane Blacksmith perk, with the benefits of tempering being doubled by the Steel Smithing perk. For more information, including leveled statistics, see The Pale Blade article. Tsun's Battle Axe is the primary weapon for the shield-thane of Shor, Tsun. The weapon lacks any enchantment and is unobtainable through any means except the console. Even if you do add it to your inventory, the weapon is marked as unplayable and will not be usable. For more information, including leveled statistics, see the Tsun's Battle Axe article. 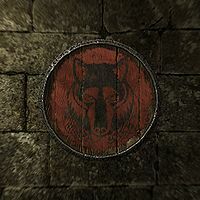 The Shield of Solitude is a shield given to you by Falk Firebeard for saving Skyrim from the return of the Wolf Queen in The Wolf Queen Awakened. Its enchantment grants a Resist Magic and Fortify Blocking effect, which reduces the damage taken from offensive spells and reduces the damage taken if you successfully block an attack. For more information, including leveled statistics, see the Shield of Solitude article. 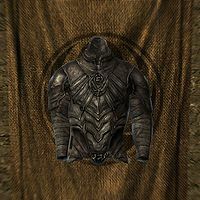 Nightingale Armor is part of a set of light armor given to you for joining the Nightingales. Its enchantment grants a Fortify Stamina and Resist Frost effect. Tempering the Nightingale Armor requires void salts and the Arcane Blacksmith perk. When wearing the armor, guards may comment "That armor... it's like nothing I've ever seen. Like forged midnight..."
For more information, including leveled statistics, see the Nightingale Armor article. 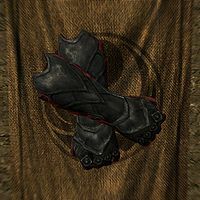 The Nightingale Boots are part of a set of armor given to you for joining the Nightingales. Its enchantment grants a Muffle effect. Tempering the Nightingale Boots requires void salts and the Arcane Blacksmith perk. 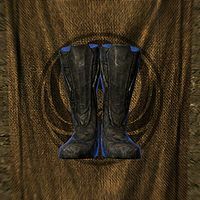 For more information, including leveled statistics, see the Nightingale Boots article. The Nightingale Gloves are part of a set of armor given to you for joining the Nightingales. Its enchantment grants a Fortify Lockpicking and Fortify One-Handed effect, making Lockpicking less of a challenge and making you more deadly with One-handed weapons. Tempering the Nightingale Gloves requires void salts and the Arcane Blacksmith perk. For more information, including leveled statistics, see the Nightingale Gloves article. 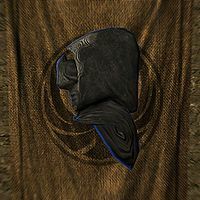 The Nightingale Hood is part of a set of armor given to you for joining the Nightingales. Its enchantment grants a Fortify Illusion effect, which decreases the cost on your magicka to cast Illusion spells. Tempering the Nightingale Hood requires void salts and the Arcane Blacksmith perk. For more information, including leveled statistics, see the Nightingale Hood article. The leveled list for this item is bugged. For more information, see the Amulet of Articulation article. 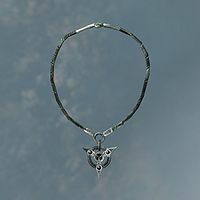 The Mage's Circlet is a circlet given to you by Savos Aren for alerting him of the need to acquire The Staff of Magnus to stop an impending disaster, in the quest Good Intentions. Its enchantment grants a Fortify Magicka effect, which increases your available Magicka pool. 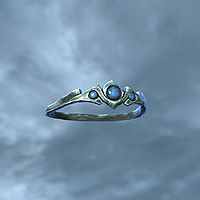 For more information, including leveled statistics, see the Mage's Circlet article. This page was last modified on 14 November 2018, at 13:36.